Stacey Reinhardt is a 22-year-old small town girl–the quintessential rebel. She loves to party and is a serial dater. Most of her relationships, if they can be called that, are one night stands or casual flings. No commitment; no strings. 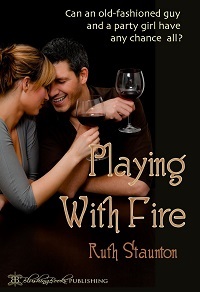 She meets Sheriff’s Deputy Cade Dawson in a bar and is immediately intrigued by him, but Cade wants nothing to do with her. He’s attracted to her, but knows she’s the type of woman he doesn’t need. She’s a flirt and a partier used to a string of one night stands, and he’s an old-fashioned man with old-fashioned ideas. He believes in respecting and protecting women. He demands loyalty and faithfulness, and he spanks. As a joke, he dares Stacey to try dating only one man for a month. She accepts and chooses him. Much too both their surprise, they quickly find their ‘joke’ relationship turning into more. Cade makes no bones about the fact that he believes in protecting women and in old-fashioned values and won’t hesitate to enforce his expectations by way of a sound spanking if necessary. At first, Stacey dismisses this as an occasional thing and no big deal, but then her old ways begin to resurface, and she suddenly comes face-to-face with the fact that Cade’s expectations and methods are very real. He will hold her accountable and spank her, and he honestly expects her to change her behavior. Will the wild child be able to change her ways for an old-fashioned spanking man, or will her rebel spirit and the pressure and rumors of a small town tear them apart?